At its annual conference this week in Baltimore, the Institute for Supply Management honored one its own this week, as Dr. Joseph Cavinato was named as the recipient of the J. Shipman Gold Medal Award for 2012. The Shipman award is generally viewed as the most prestigious honor in the supply management discipline. It is was first created all the way back in 1931, and is named for Johnson Shipman, a pioneer member of the New York Affiliate of the National Association of Purchasing Agents who is credited with years of activity that moved the purchasing profession along. Cavinato is ISM Professor of Supply Chain Management at Thunderbird School of Global Management in Glendale, Arizona. He is also founding executive director of the A.T. Kearney Center for Strategic Supply Leadership at ISM. In 2003, Cavinato joined the faculty at Thunderbird School of Global Management. He created Thunderbird’s global supply chain leadership course, which became the most popular elective course for MBA students attending the world-renowned graduate business school. He continues to lead Thunderbird’s global supply chain leadership program. Cavinato earned his Ph.D. from The Pennsylvania State University in 1975. After a brief stint at the University of Georgia, he then returned to Penn State in 1978, where he remained on the faculty for the next 21 years. At Penn State, Cavinato developed a senior-level purchasing course in the undergraduate program and, later on, another course in the MBA electives. The courses were different from existing purchasing courses at other schools and they proved to be instant successes with students and recruiters. Cavinato next developed a two-week executive program in purchasing and materials management that was offered from 1984 through the late ’90s. In 1990, Cavinato began an ongoing qualitative research study, conducting personal interviews with individuals in different departments at various companies and asking them to reflect on three simple questions designed to ascertain issues, challenges and opportunities for the next three to five years. To date, Cavinato has interviewed more than 6,500 managers and executives at 937 companies on six continents. Information and insights gleaned from the interviews frequently serves as the foundation for Cavinato’s teaching, writing and speeches. He has authored more than 200 research academic articles, industry magazine pieces and white papers on global supply/value chains, business models, purchasing and supply, logistics and transportation, corporate social responsibility and top-line growth. During the early ‘90s, Cavinato started to profess the growth of the field and the concept of supply. He developed a white paper that detailed what his qualitative research was showing — changes in the field, external influences and a marked shift in executives’ expectations were creating vast new opportunities for supply professionals. This white paper, written in 1994, included a definition of supply management that became central to ISM’s (then NAPM’s) definition of supply that is still regarded today as the ISM definition of supply management. Among Cavinato’s other accomplishments was his creation and use of financial models for procurement in the early 1980s. 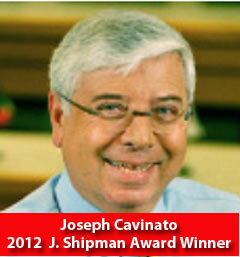 Cavinito succeeds Shelley Stuart, chief procurement officer at Tyco, who received the honor in 2011. Do you know Cavinato? Let us know your thoughts on his receiving the Shipman Award foe 2012. I was trained by Joe at Management Centre Europe where he taught a number of courses to delegates from blue chip organisations. Joe was then and remains now an inspiration. He saw the future potential of the field and has been an avid supporter of talent in the profession giving freely of his time and effort to help lots of his ex students in their careers. A very worthy winner of the highest honour in the profession. Many congratulations Joe. I was a student in Dr. Cavinato's first pilot course in Procurement at Penn State in the Spring of 1981. Dr. Cavinato amazed us students with his voluminous knowledge of the topic and delivering this knowledge in a fun and interesting fashion. I have no doubt that Dr. Cavinato is extremely deserving of this prestigious recognition.